(Sect. 20.5): A functional group characterized by two alkoxy (OR) groups connected to the same carbon atom. Acetals can be used as protecting groups for aldehydes or ketones. 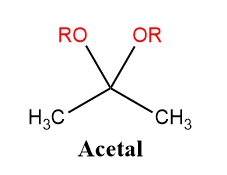 Acetal groups usually form when alcohol attacks an aldehyde or ketone (See “Acetal Formation” mechanism). Compounds such as Sulfuric Acid and p- toluenesulfonic acid are example products formed from an acetal reaction.